Back in 2014, Dorling Kindersley released the LEGO Ninjago Visual Dictionary and five years later, they will be releasing a new edition of it. Found on Amazon, the updated dictionary will have 128 pages and will be releasing in September 2019. The original copy of the book included the Rebooted storyline Zane minifigure and the updated version will also include an exclusive minifigure. Do you have any guesses on who it will be? Perhaps someone we haven’t seen before in minifigure form? I’ll update when Amazon US has it up for preorder. Thanks to JC for the heads up! Spin through the LEGO® NINJAGO® world with this fascinating visual guide. 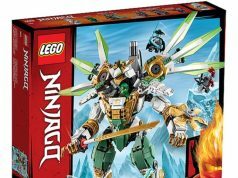 Discover NINJAGO City with Lloyd, Kai, Cole, Jay and Nya and meet their dragons and foes, including the Vermillion and Sons of Garmadon. Explore the amazing sets, vehicles, mechs and weapons. Look around the S.O.G. headquarters, examine the awesome Ninja Nightcrawler and Destiny’s Bounty, and learn all about the art of Spinjitzu. Discover how the awesome LEGO NINJAGO sets and minifigures are created in the Beyond the Brick chapter, which features concept art and an interview with the LEGO NINJAGO design team. With the LEGO NINJAGO: Visual Dictionary, you will find out everything there is to know about the LEGO NINJAGO world. The book comes with an exclusive LEGO NINJAGO minifigure!